Planning a trip away or holiday can be complicated enough at the best of times, but even more so when you have specific requirements and needs to be met. The Suffolk Hotels Guide is pleased to offer you the following hotels that are suitable for disabled guests. 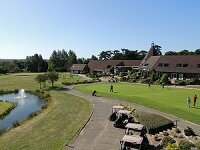 Set within 120 acres of stunning parkland with impressive views of the Deben Valley, Ufford Park Woodbridge Hotel, Golf and Spa is fully accessible and has three bedrooms on offer with disabled facilities such as walk-in showers and low-level beds. The hotels also offers a number of activities for you to partake in (or treat yourself to!) such as: bird watching, unwinding in the steam room or sauna, spa treatments, facials and a hair salon, plus much more! Please click on the link above for more information. Find things to do and places to go in Suffolk that are wheelchair and disability-friendly by clicking on the link above. The Days Inn Haverhill is a modern yet affordable disability accessible hotel. There is wheelchair access throughout the hotel, plus four bedrooms with full wheelchair access, low-level beds and disabled facilities - perfect for groups on holiday together. Another useful facility is the Public Disabled Toilet, avoiding the need and bother required to return to your own room each time to take a pee! Please contact the Days Inn to discuss your requirements further and make a booking. The Wentworth Hotel, Aldeburgh is an ideal retreat for those wanting to relax by the sea in the Suffolk Coastal town of Aldeburgh. It offers spacious lounges, a 2AA rosette restaurant and open fires in the colder months. The Wentworth has one specially designed room for disabled guests with wheelchair access. Please contact them by clicking on the link above for more information. The Westleton Crown is a coastal Suffolk inn with traditional features, and offers you an enjoyable and easy stay in their large and spacious room with disabled access. The room includes a level shower, large sofa, super king size bed, and fridge. There is a 24 hour night porter, and breakfast can be delivered to your room. Please click on the link above for more information. There are plenty of Pubs and Inns in Suffolk that have Wheelchair Access and Facilities for the Disabled - please click on the link above for more information. The Stoke by Nayland Hotel, Golf and Spa is to be found in 300 acres of beautiful Suffolk countryside, and offers a number of disbaled rooms. These rooms are wheelchair accessible via wide doors, and have disabled bathrooms. Please click on the link above to enquire further - and, while you're at it, why not check out the other facilities on offer, such as pampering Spa Treatments and Afternoon Tea? Hintlesham Hall Hotel, Ipswich, is an impressively grand accommodation option, perfect for those who want to treat themselves to a get away they'll never forget. There is one ground floor bedroom with wheelchair access. The room matches the character and decor of the rest of the hotel and has the addition of a wet room. The entire ground floor of the hotel is fully accessible for wheelchairs. Please click on the link above to find out more about this fantastic hotel. With a first-class reputation for excellent accommodation, service and affordablity, the Suffolk Premier Inn chain of hotels offers full disabled access and facilities. Every hotel has step-free or ramp access for wheelchair users, specially designed and spacious disabled en suite bedrooms that are usually located close to the reception or the lift, a range of seating options in the bars and restaurants, plus reliable assistance from staff members upon request - all of whom have received disability awareness training. There are many more facilities to make your stay as easy as possible. Please click on the link above to find out more about Suffolk's Premier Inns, and to enquire with a hotel in a location of your choosing.